This kid-friendly fish curry couscous is very easy and ideal for kids from 1 year, as the fish has been deboned well to avoid any choking hazard. 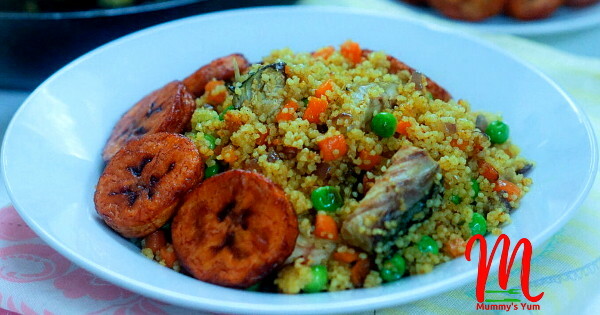 Couscous is a type of pasta that is made up of semolina and wheat flour. It can make a good alternative to rice dishes for kids as they almost look the same in appearance. The best thing about couscous is that it does not need any cooking, so all you need is hot boiled water or stock to make one up. It also increases in size a lot, so a little goes a long way. Clean fish well, cut and put into a pot. Add 2 tsps curry powder, thyme, stock cube, a little onions and 2 cups of water. Bring to boil for about 10 minutes. Remove the fish to cool, strain ¾-1 cup of the boiling stock and pour immediately into the couscous in a bowl. Stir and cover for at about 5-10 minutes to cook and rise before fluffing up with a fork. Meanwhile, debone the fish, carefully removing all the bones from them. Put a pan on gas, pour cooking oil and add chopped onions to fry for a while. Add the carrots and remaining curry powder. Add some of the remaining stock and let cook for about a while. Add the peas, deboned fish and fluffed couscous, stir to combine, cover to steam for a minute and bring down. Cook this and send a picture or tag @mummysyum on Instagram and Facebook. You can also make a Chicken Couscous instead.